Meanwhile, heat oil in large deep nonstick skillet on medium heat. Add leeks and shallots; cook 5 to 7 min. or until softened, stirring frequently. 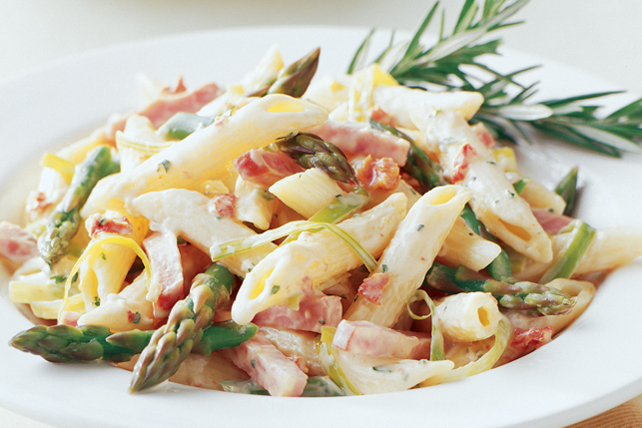 Add asparagus, ham and pasta sauce; stir. Cook on medium-low heat 3 to 4 min. or until heated through, stirring frequently. Drain pasta; place in large bowl. Add pasta sauce mixture and parsley; mix lightly. Add 1/4 cup Kraft 100% Parmesan Grated Cheese to drained cooked pasta along with the pasta sauce mixture and parsley. Add asparagus to pan of boiling water; cook 2 to 3 min. or until bright green in colour. Drain, then immediately plunge asparagus into bowl of ice water to stop the cooking process. When completely cool, drain and pat dry.